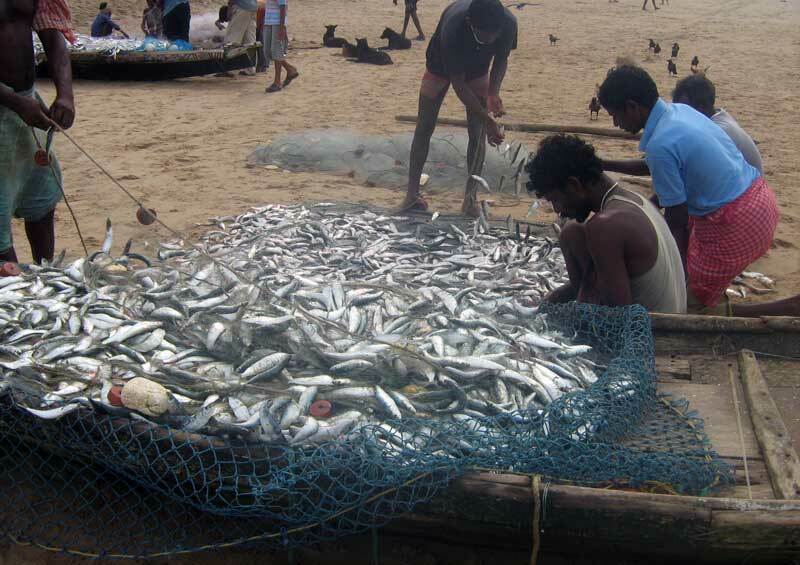 Fish farming in India is a popular form of agriculture. A well maintained fish farm can give a handsome profit. Learn how to set up fish rearing ponds and start fish farming business. Fish farming is also called ‘pisciculture’ and is the practice of commercial fish rearing in enclosed tanks. In India, it is an important sector contributing to agricultural exports and food security in a major way. Since the demand for fish as a food is increasing it has resulted in overfishing worldwide causing a depletion in the population. This has led to establishment of fish farms or aquaculture wherein fish is grown artificially in man-made ponds or tanks. Aquaculture has now become so popular that more than 50% of the total fish population in the world came from aquaculture alone in 2016. Globally, 62% of the total fish supply comes from China. At least 60% Indians consume fish as a part of their regular meals. The demand for fish being high in the market, its price is also very high ensuring good income. The subtropical and tropical climate of India is ideal for growth and production of fish. Since there are abundant water sources in India like lakes, ponds, rivers, streams, etc. it is not very difficult to procure fish and grow them in the farm. Growing fish in a farm is not a laborious process. Additionally, it can be integrated with other types of farming like poultry, vegetables, animals, etc. Integrated aquaculture is very popular among farmers. Since fish farming is not as laborious as other types of farming, it is easy to handle along with regular work. It can be also easily managed by other family members of the house like kids and women. Fish rearing in pond has some specific requirements. Before constructing a pond it is necessary to choose the right type of site. Hence the first step in fish farming is selecting the right type of site. Biological factors are concerned with fish species chosen for culture purposes. Seed source, variety, culture type, species, etc. must be considered at the time of establishing a fish farm. Primarily the soil must be able to hold water in a pond. That is it must have good water retention capacity. Take a handful of soil in wet hand and squeeze it. If the soil retains the shape after opening the palms, the soil is suitable for establishing a pond. Rocky, limestone, sandy soil must be avoided since they cannot retain water. Loamy soil, clayey soil, silt etc. are best suited for pond construction. Gravel if present must not be more than 10%. Water must have a neutral pH. In case of acidic or alkaline water suitable corrections must be done. The pond must be constructed near natural water bodies like ponds or rivers. However, it should be away from flooding area. Water salinity is another factor that must be considered as not all fish can tolerate saline water. Land topography is essential for engineering the pond construction. Areas like industrial zone, flood prone areas, areas with poor rainfall, electricity poles and densely rooted vegetation must be avoided. Considering social factors while starting a fish farm may sound paradoxical. This is however important since the tradition and culture of the place must be taken into account. This would ensure acceptance of the farm by the locales and no legal issues. Other factors include market aspects, transportation, accessibility, infrastructural facilities, etc. Pond construction at the chosen site involves a series of steps such as cleaning the site, constructing the bank or dyke, digging the pond, constructing the inlets and outlets, covering the dyke and last but the least- fencing the pond. The site must be cleared of bushes, tree stumps and other such debris. Trees and other vegetation within 10 meters of the pond area must be cleared away. In addition about 30 cm of surface soil must be cleared since they are likely to contain roots and other organic debris that interfere with the pond development. An ideal dyke must contain 15-30% silt, 30-35% clay and 45-55% sand. After digging the dyke the ridge must be in proportion with the slope. A mixture of sand and clay in 1:2 proportions must be deposited to form a 15 cm thick layer in order to elevate the dyke. This is done at the center of the pond. Generally, digging is done in plain areas while in hilly areas, embankment method is followed. The dykes are erected on the sides as per need. However, embankment method cannot be followed for fish culture since it is difficult to get the standard depth and size as per specifications. Ponds must be filled with sufficient quantity of water for which feeder canals are constructed alongside. The inlet and outlets permit flow of water. Inlets are constructed at the top of the pond while outlets are at the pond bottom. The inlet pipes must be designed such that they do not take more than 2 days to fill. Outlets are used when dewatering of the pond to harvest the fish becomes necessary. It is also used to drain out the stale water while replacing it with freshwater so as to maintain the water quality. 3 day old spawns are reared in this pond until they attain a length of 2-3 cm. This takes about 30 days. Tiny, newly-hatched fish grow and start feeding themselves. However they are not fully grown adult fish. Such fish called ‘fry’ are reared in the rearing ponds till they attain a size of 12-15 cm. These fish are called fingerlings. The fingerlings are grown in the stocking pond and reared into marketable sized fish. The duration varies between 8- 10 months. Although there is no specified rule about the pond size, the area of the pond ranges between 1-2 hectares. Bio-ponds are settling tanks that are sometimes also used as stocking ponds. The water meant for the fishpond is biologically purified in this pond. After pond construction the next step is to choose the right type of fish breed for rearing. The first point to be considered here is the type of fish to be reared- whether ornamental, freshwater or brackish water fish. Choosing the right type and breed depends on the type of water in the pond, resource availability, climate conditions and market demand. 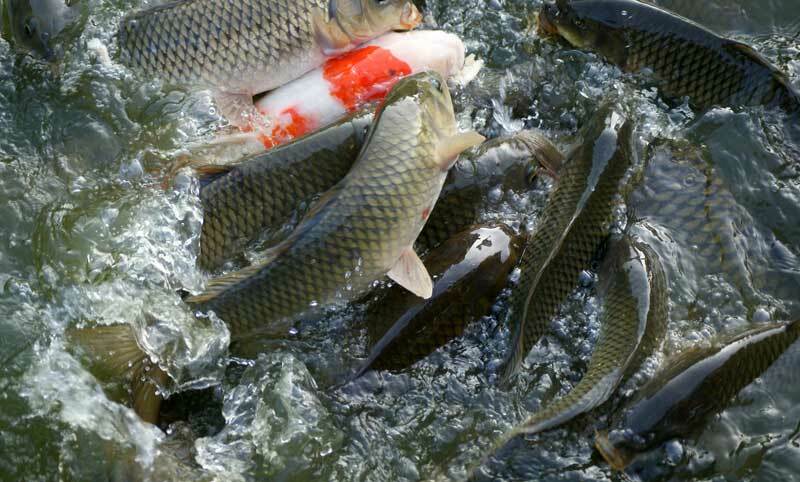 For example, carp varieties of fish like rohu, catfish, catla, grass carp, etc. is meant for the Indian ponds. Some farmers grow two or more different breeds of fish in the same pond as this ensures better utilization of resources. In case of ornamental fish, some of the commercially important species are loaches, barbs, freshwater sharks, danio, goldfish, etc. 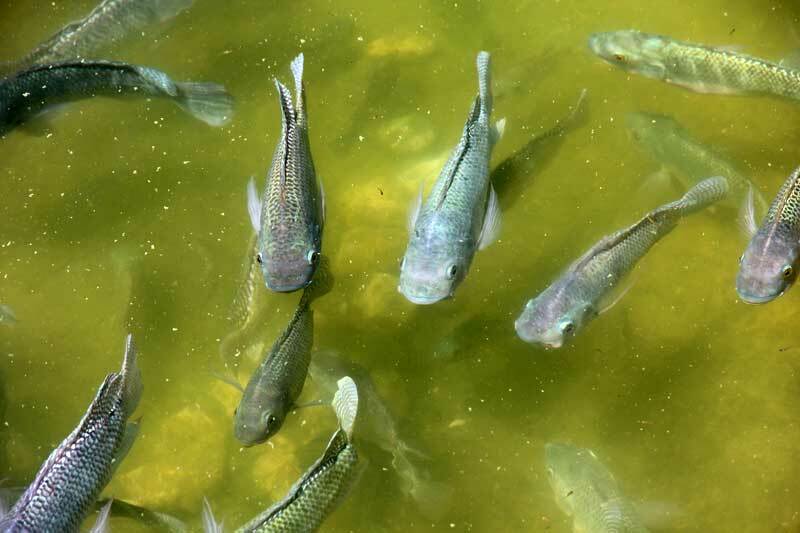 While rearing fish in ponds, feeding is done to ensure that the fish attain maximum weight as per market standards within the shortest possible time. However, while feeding and rearing care must be taken to maintain the water pH between 7 and 8 for optimal growth. The feed must provide essential nutrients for the growth, maintenance and reproduction. The feed must contain essential nutrients like proteins, carbohydrates, vitamins and fats in addition to other minerals in sufficient quantities. 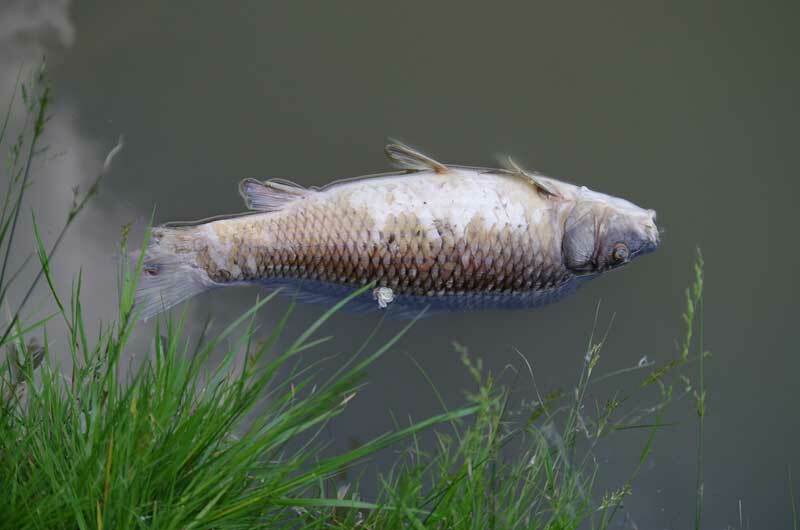 It is easier to maintain natural foods in the fish pond like zooplankton, phytoplankton, insect larvae, etc. That way, the natural habitat necessary for growth of the fish is maintained to some extent. The growth of phytoplankton can be given a boost by adding various wastes from organic farming to the pond such as poultry droppings from poultry farming, organic compost, etc. In addition, supplementary feed is given in moist or dry form. For fish that feed from top layers, floating pellets can be given while those feeding from the bottom are given sinking pellets. The first precaution in fish farm maintenance is to maintain the water pH. The pH must be maintained at neutral for optimal growth of the fish. In addition it must be treated with salt, potassium permanganate, etc. to prevent growth of pathogens. Occasional water treatment also ensure prevention of viral attacks. Fish farming in India is a profitable business. One can start a stand alone fish farm or integrate it with other farming to minimize the risk and maximize the profit.